What most people – even locals – don’t know is that there is a penguin colony a short tram ride from the CBD. 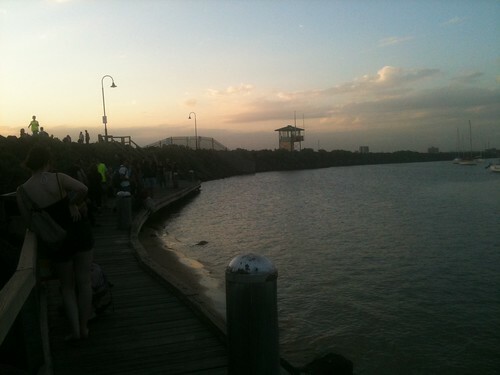 It’s at the St Kilda breakwater, which is the line of rocks at the end of the pier. The breakwater was actually constructed for the 1956 olympic games – prior to this, penguins weren’t usually found in the area. In the 1980’s, people discovered penguin where living there and the colony has been the subject of study and conservation ever since. Now the colony numbers at around 1300. You certaintly wont see that many, but it’s a really interesting place to visit. They have created a environment where the public can see and learn about the penguins, yet most of the colony is fenced off and protected. You can see the penguins if you visit there at dusk. There are a bunch of helpful volunteers that will show you were the penguins are and answer any questions you have. I recommend talking to them as they know so much about life cycle and history. You’ll probably see about 20-30 penguins, as well as a couple of water rats. In the summer, it may be too late for young kids. There are also a lot of tourists, so expect for it to be crowded. Also expect to have a lot of people blocking your view just to get a photo. You can’t catch a train to St Kilda – you have to get there via train. You can catch the 112 or 96 from in front of spencer st Station. The 96 will get you closer, and is a much nicer ride. I was worried that I’d get there and not know what pier they were talking about. Seriously – there is just the one pier. It’s long, and you can see a line of rocks beyond the restaurant. I get lost easily and I was able to find it pretty quickly. The boardwalk consists of a walkway, and then a larger area with a few seats. This leads towards a further set of steps. When I got there, we sat on the seat. 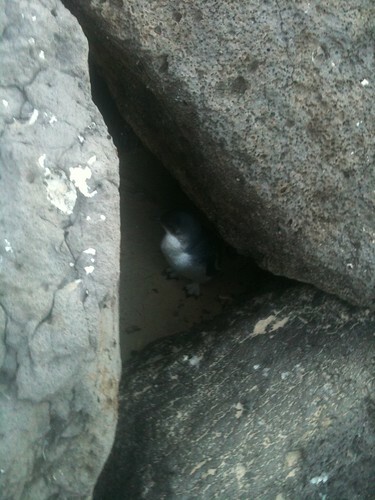 There was actually a small penguin under the seat, and two hiding amongst the rocks. Wherever there was a penguin, there was a group of people around them talking loudly with camera. Be prepared to have to wait to get a glimpse of it. Around nightfall, you will start to see the penguins come in. A lot of people hung out around the area where thre was the beach, assuming that you’d see them walk across the beach. Those that did went so quickly that you barely saw them, and even then there was usually someone leaning forward so you could barely see it. The best chance was waiting until they had gotten onto the rocks and started exploring. The volunteers would shine a torch on them for about 10 minutes, and you were able to get really close to them. There was about 20-30 there. I found the best vantage spot was sitting in an isolated area beyond the steps. You are away from the crowds and can sit there silently watching the penguins climb up. You don’t get as close, but it’s a lot nicer.